The Rafters at Bank House in Millom sleeps 4 people. Bank House in Millom are two apartments which are located within an imposing building which dates back to 1894, and was originally built by the Bank of Liverpool. The bank later relocated next door and the ground floor became the post office. The building still holds its place as one of the most architecturally impressive in the town and is situated in the Market Square, described as the hub of Millom. Shows featuring well known comedians are held in the community arts theatre, and you can visit Millom Discovery Centre with its full-scale drift mine exhibit, information about the local poet Norman Nicholson, as well as the Hodbarrow iron ore mines and social history all relating to Millom and nearby surrounding areas. The nature reserve at Hodbarrow, 1 mile, is Cumbria’s largest coastal lagoon and many species of bird can be spotted there; the reserve leads onto some hidden beaches and coves. Silecroft beach is a short drive ride away, and both beaches offer an expanse of sand when the tide is out, which is great for dog walkers. The beach is ½ mile. With the shop 20 yards, the pub is 30 yards, and the restaurant 40 yards from Bank House in Millom. Estuary View (ref UKC1200 [Estuary View]) can be booked together with The Rafters (ref UKC1201) to sleep up to 8 people. The Rafters is all on the second floor. Living/dining room: With gas fire, 32 Freeview TV and DVD player. 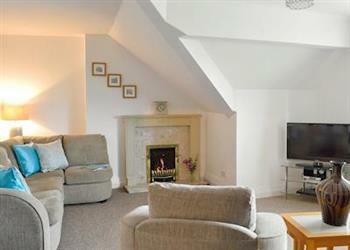 Both properties: Gas central heating, gas, electricity, bed linen, towels and Wi-Fi included. Travel cot and highchair. Welcome pack. Parking permit for 2 cars included. No smoking. Holidays at The Rafters, Bank House run from Friday to Friday. Pets allowed at Bank House - The Rafters. For a better idea of where Bank House - The Rafters is, you can see Bank House - The Rafters on the map below. Bank House - The Rafters is in Cumbria; should you be on the lookout for a special offer, you can find all the special offers in Cumbria. It's always worth checking to see what is on offer at the moment. Do you want to holiday near Bank House - The Rafters (UKC1201), you can see other cottages within 25 miles of Bank House - The Rafters; have a look to find your perfect holiday location.